Jordan Neeck ’11 (left) with fellow frater, runner and podcaster Johnathan Turba. A life in religion … and in running shoes? Jordan Neeck ’11 and Johnathan Turba are training for ministry … and for marathons. They launched a podcast in October, “Canons on the Run,” and have since recorded a series of episodes discussing religious life as millennials in new media. Topics include the challenges and triumphs of community life, the recognition of everyday gifts and, of course, running as ministry. As distance runners and former cross-country running coaches, Neeck and Turba have each completed marathons. They connect their commitment to running with their commitment to religious life and its emphasis on sustained reflection. They often brainstorm episodes on long runs, creating storyboards when they return. 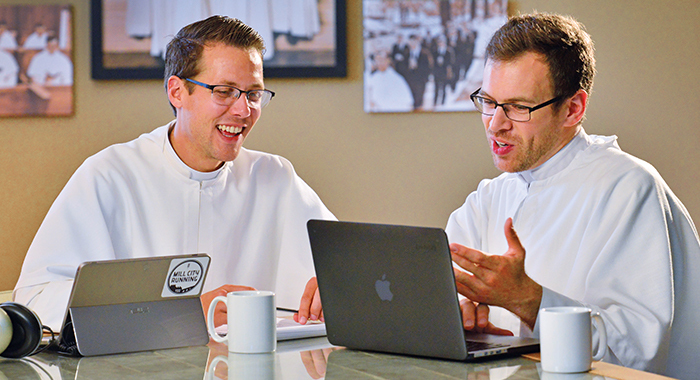 Both took time after college to live in the professional world – Neeck as an accountant and Turba as a music teacher – before entering Norbertine life. It was while Neeck was studying for his Master of Divinity degree at Catholic Theological Union that he saw his classmates creating projects like church bulletins and Bible studies. He wondered what it would look like to engage in a contemporary media ministry, like a podcast. Meanwhile, Neeck and Frater Anh Tran ’11 were busy meeting at St. Norbert Abbey, developing new Norbertine media projects. After connecting the dots, they joined forces with the abbey’s communication team, and “Canons on the Run” was born. The co-hosts now work closely in a team that also includes Judy Turba ’76 (director of external relations), Katrina Marshall ’09 (communications coordinator), and Tran, who can draw on his M.B.A. and M.A. in servant leadership to help formulate their marketing and development strategy. Though podcasting is relatively new, Neeck and Turba are following a (jogging) trail blazed by their Norbertine forefathers. The order has a history of media involvement as early adopters of radio technology for evangelism. Green Bay’s WBAY Channel 2 was initially developed by the Norbertines before its sale and modern-day iteration as an ABC station. In fact, the Christian oral tradition spans the millennia, from the parable storyteller to the traveling preacher. Christians have always been sharing stories about God and self, only now they can rely on on-demand access free for the downloading. It’s all in “Episode 1: From Broadcast to Podcast”! 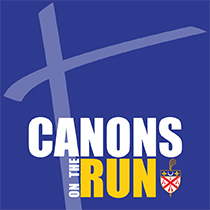 To understand more about the mission of the Canons on the Run podcast and listen to episodes, visit the St. Norbert Abbey website.